Tupello Property ServicesBlogBlogWhat Exactly Is An Ambriad Heater And What Are The Advantages? There are a number of warehouse heating systems you can choose from. The most common are the ambirad heating system. It is basically a range of radiant heating systems which supply heat your warehouse by transmitting heat through the air. So how does an ambirad heater work? Do you see the way the sun works with heat being radiated from a central source to the rest of the universe? ambirad heating systems work in the same way. If you are looking for warehousing heating solutions that will deliver heat through infrared rays, then ambirad is what you need. Most of the ambirad heating systems are mounted overhead just like the sun. The heat they produce is them directed downwards by a specially-mounted reflector. An ambirad heater can be used for heating a large room where space is interspersed with shelves and products. As infrared energy from an ambirad heater passes through the air, it comes into contact with people and surfaces upon which they release the heat. Through an ambirad heating system, you will be able to create a comfortable all-around warmth even when the air temperature is low. If you want warehouse heating systems that deliver warmth to your products without overheating the air, this is what you need. Unlike other warehouse heating solutions, Ambi-Rad takes just a few minutes to hit comfortable temperatures. No energy is wasted because of the long time it takes to warm up the air using other systems. It doesn’t matter if doors and windows are opened to allow cold air to enter the building. Ambirad heating systems will return you to the comfortable temperatures within a matter of minutes. Energy efficient. 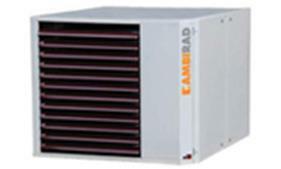 Unlike other warehouse heating systems, Ambirad enables you to save a lot of money. Quiet to the ear. Ambi-Rad heating doesn’t use forced air like other systems. That makes them so quiet you wouldn’t know you have a heating system installed. Good for people who suffer from allergies. Unlike other warehouse heating solutions, Ambi-Rad doesn’t blow air through ducts. That means no allergens and blown into the house. Consistency in temperature. When you use radiant floor heating, you will be able to deliver heat to the room via the rising warm air. There is clearly no reason why you shouldn’t buy an ambirad heater for your warehouse. Talk to your ambirad supplier today at Tupello Property Services and you won’t regret it.